How have Bioseed hybrids performed on the ground? Here are stories from different Bioseed markets. Jalinder Deobe Knade of village Kalamb, Taluk Ambegaon, District Pune, has this to say after switching to Bio Jubilee, the cabbage hybrid: "What a difference it made. Last year, I lost the entire crop to disease. But this year with Bio Jubilee my net income increased manifolds. A disease-free harvest ended with great profits." A seasoned cotton farmer, Ratnam Sammireddy of Village Nagaram (District Warangal) in Andhra Pradesh, planted Bt. cotton Chiranjeevi over three fourths of an acre of light soil, in rows less than a metre apart. 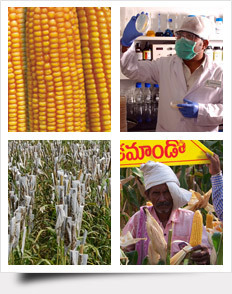 Using the seed and the technique, Ratnam Sammireddy reaped many benefits. Here's the list in his own words: "Germination was 93% as the crop responded quickly to the fertilizers applied. I got the first picking of 6.5 quintals in no time. The boll size was unique, weighing 6.4 grams. Also, the bolls at the bottom and top were almost equal. "As it rained little and the ground water was low, Bioseed advised me to irrigate every alternate row. By doing so, I saved water and it allowed me to introduce another dose of irrigation after 25 days. What a difference this made together with the use of foliar sprays after 60 and 80 days! "The sucking pest incidence was also low in comparison to others and I just gave two sprays, despite a high incidence of jassids and thrips in the area. Ultimately, I harvested 12 quintals and expect another three quintals shortly. The best part is I can get an additional price of Rs 20/qtl for fibre quality. "Everyone earned more, even the pickers. "My field stands out; it is green in comparison to others in my neighbourhood. The Government Agriculture Officer in the area has taken note of Chiranjeevi and its performance. Next year I plan to plant four acres of it." Crippled by debt after the suicide of his father in 1996, Mothi Reddy migrated from his village – Kantathmakur in Andhra Pradesh – to Warangal city. He returned 12 years later when he heard of the "magic seed", Chiranjeevi BG2. He was told that yields went up manifold and he decided to plant the seed in a part of his six-acre farm. He smiles at the outcome: "I now get 12 to 15 quintals an acre, more than double than what my father got. The yield translates into 30% profit. With this money, I've carried out renovations in our house and sent my son to engineering college." In Karnataka, corn is a major crop. Several hybrid options have flooded the market. Rather than experiment, M V Omakarappa of Medduganhalli village in the district of Davangere, sought the advice of trusted friends, the Bioseed agronomists who have, for years, kept a close eye on the performance of his 22-acre farm. The agronomists recommended Bioseed 'Rajkumar', the spacing (60cm X 20cm) and the manures to be used in the cropping period. The difference was noticeable to M V Omakarappa's experienced eye. "Rajkumar is the only hybrid that makes efficient use of manures and soil nutrients and the only one with non-lodging characteristics in adverse conditions of heavy rain and winds. The output was equally impressive: uniform cob size, complete sheath coverage, more grain weight and a healthy colour. I now recommend Rajkumar to every farmer I meet." In Vietnam, the Bioseed Corn Hybrid 9698 and the Bioseed Rice Hybrid 404 have won the highest agricultural honour, the coveted 'Golden Cup'; 9698 for its outstanding contribution to agriculture over the last 10 years and 404 for its potential. Both hybrids are among the top ten agricultural products in Vietnam, ahead of 82 others developed by competition. Dang Ngoc Thao grows corn in the Gia Lai province of Vietnam. He switched to Bioseed B9698 about ten years ago, raising annual yields significantly since then. For a time he had experimented with other hybrids from other companies but their performance was nowhere near Bioseed. In 2008, he added Bioseed B06 to his corn portfolio. The two Bioseed hybrids together yield an average of 12 tons per hectare. "Our living standards are higher than ever before. We now own a tractor-driven plough, a motorbike, a TV and a whole lot of other gadgets. And all my three children go to school." He believes Bioseed, more than any other factor, is responsible for his newfound prosperity. Farming is difficult in the mountains of Northwest Vietnam (Sơn La province), where Duong Duc Hoan and his wife Dang Thi Chung grow corn. Using the government subsidy that came their way in 2004, they began sowing the new Bioseed B9698 hybrid. This proved to be the turning point in their lives. The first season saw their yield rise to a record level. Says Duong Duc Hoan: "We were introduced to some other hybrids later but we stuck with B9698." Not until the arrival of another Bioseed hybrid, the B06, did they experiment. "B06 was another great success and has further strengthened our belief in Bioseed hybrids." Today, Duong Duc Hoan and Dang Thi Chung are listed among the more prosperous people in the village of Tà Liết and act as brand ambassadors of Bioseed. "We have introduced Bioseed hybrids to other farmers. Their living standards have also improved." Disease and stress have made life difficult for farmers in the Philippines. Over the years, both rice and corn yields have plummeted by nearly 40%, reducing incomes by the corresponding figure. In light of this, Bioseed Philippines is doing all it can to find solutions that would stand up to the destructive forces of nature. In 2006, Bioseed launched Hybrid Corn 9909 with traits that counter stalk and ear rot and, at the same time, flourish in areas where 80,000 plants are sown in every hectare. The results of the launch were reported in Agriculture Magazine of July 2007. It quoted 60-year old Justo Domasco, a farmer in Banga, South Cotabato: "Bioseed 9909 is resistant to stalk rot, a serious disease which causes the stalks to topple down. Bioseed 9909 has a tough stalk and hence, it is hardly infected by the disease. In the past, damage caused by stalk rot in Banga reached 20% to 25%. Since the damage in Bioseed 9909 is almost nil, yield and final income have increased tremendously." Mr Artemio Trinidad of Tambobo-an, Claveria, Misamis Oriental, concurs: "With Bioseed 9909 I have been continuously harvesting up to 7000 kilos of dried grains per hectare. The noticeable trait of 9909 is its high recovery."